Like Valentine’s day and Christmas, Halloween has recently started gaining popularity in Japan, something which could be completely expected if thinking about some of monster folklore that’s popular in Japanese culture. When you take a look into Japan’s traditional culture, it’s completely natural that Halloween has taken hold in Japan. ・妖怪 （ようかい） meaning a monster or ghost. ・物の怪 (もののけ） meaning vengeful ghost. ・怪獣 (かいじゅう) meaning monster, like Godzilla. ・化け物 （ばけもの） meaning monster or ghost. Here is a Halloween inspired post, covering some common Japanese monsters you might encounter while absorbing the culture. Rokuro-kubi, translating to “pulley neck”, is a type of female yōkai who’s neck can expand and contract. In the original version, the head is instead detachable. These goblins, 天狗, meaning “heavenly dog” don’t really look like dogs. The word originally comes from Chinese, but in Japan were depicted as demons taking the form of birds of prey. The long beaks that were initially drawn on them later transformed into their defining long noses. They may be sort of cute, but 河童 (meaning “river child”) are still yōkai and described as troublemakers, though obsessed with politeness. The empty spot on top of their head must remain filled with water or they lose their power and eventually die, and so it’s said one method to escape a kappa is to bow to it– they’ll return the bow, spilling the water from their head rendering them powerless. Kappa’s are quite popular, some locations in Japan have signs warning of water dangers showing an image of a Kappa. There’s even a hairstyle named after them: the おかっぱ, which is a bowl cut, resembling the top of a Kappa’s head. There’s also an expression, 河童の川流れ, meaning “a Kappa swept away by a river”, which translates to “even experts make mistakes”. 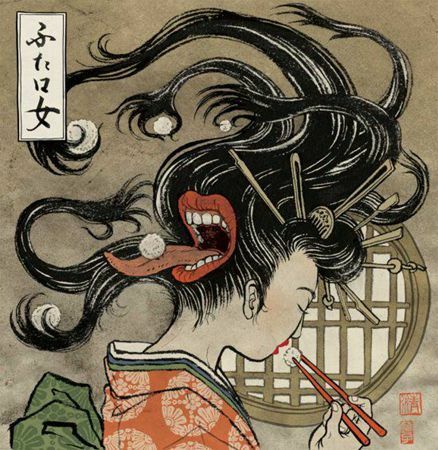 Futokuchi-onna, or “two mouthed woman”, is a type of female monster who has two mouths– one being on the back of their head. In stories, their true nature is usually not revealed until the very last second. There are variations, but it’s usually linked to a woman married to a miser and rarely eats, and becomes a yōkai. A mouth forms on the back of their head demanding food, which eventually splits open, with their hair acting like serpents grabbing food to stuff the mouth with. Hitotsume-kozou (meaning “one-eyed young monk”) is a rather harmless type of yōkai that take on the appearance of a young monk in training with a bald head and one eye, often described making sudden appearances to startle people. These guys, the 垢嘗, meaning “filth licker”, come out at night to lick the grime that builds up in an unclean bathroom, which is a good reason to make sure it’s always sparkling clean! The word 垢 (aka) meaning filth, is a homophone with 赤 (aka), meaning red, and so they are often depicted as being red in color, though in the graphic is green. The kasa-obake is a type of possessed item, with one eye, one leg, and sometimes a tongue (or even arms). Like the hitotsume-kozou, not only do they have one eye but are also considered generally harmless. In some tales, as tools and items get older and older, they gain the ability to turn into an apparition, called a 付喪神 (つこもがみ). There are a lot of other common types of these besides umbrellas, like lanterns, jars, and paper screens.